Great panoramic lake view! 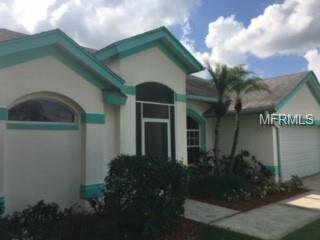 This well maintained 3 bedroom/2 bath home is located in the desirable Braden River Lakes Community. Huge screened in lanai has in-ground spa and can accommodate a nice size pool if desired. The home offers a split plan design. Family room features vaulted ceilings, bright and open kitchen, large eat-in area with sliders to lanai. Large master bedroom boasts lake view and walk-in closet. Master bathroom has a large walk-in, updated shower. The two remaining bedrooms also have walk-in closets. Super active community with a pool, tennis courts, park, playground and picnic area. Come see it and make an offer. Seller is motivated. Listing courtesy of EXIT KING REALTY. Selling Office: RE/MAX TROPICAL SANDS.